Does the rainbow with the pot of gold end in Bangkok? 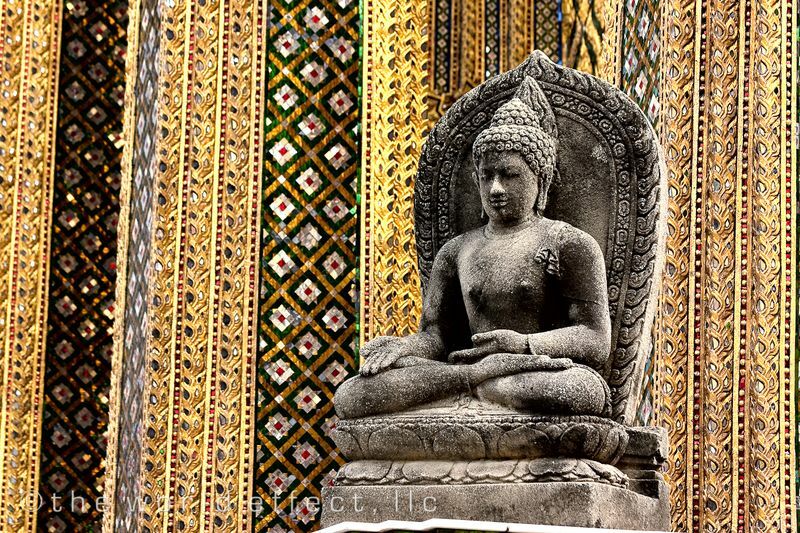 That question should seriously be asked after you visit a few of the beautiful temples in Bangkok. 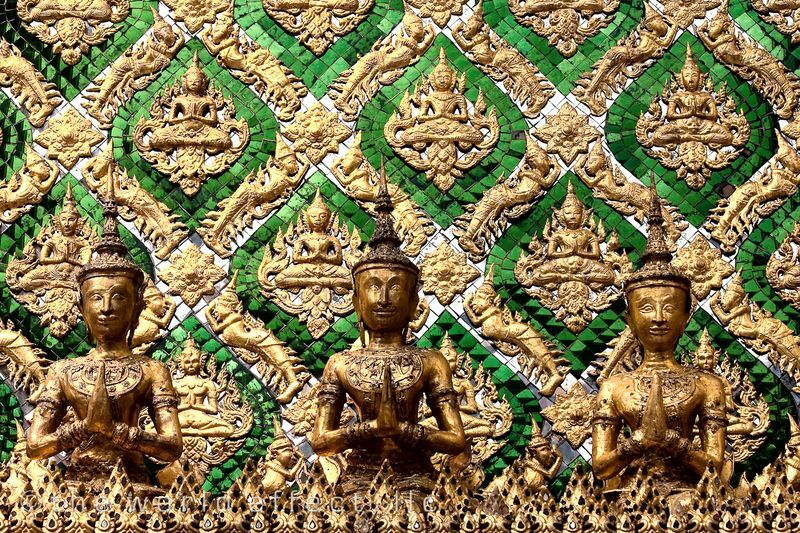 Beau and I were amazed by the extent of opulent finishes that cover the exterior, interior, and Buddhas of the temples. 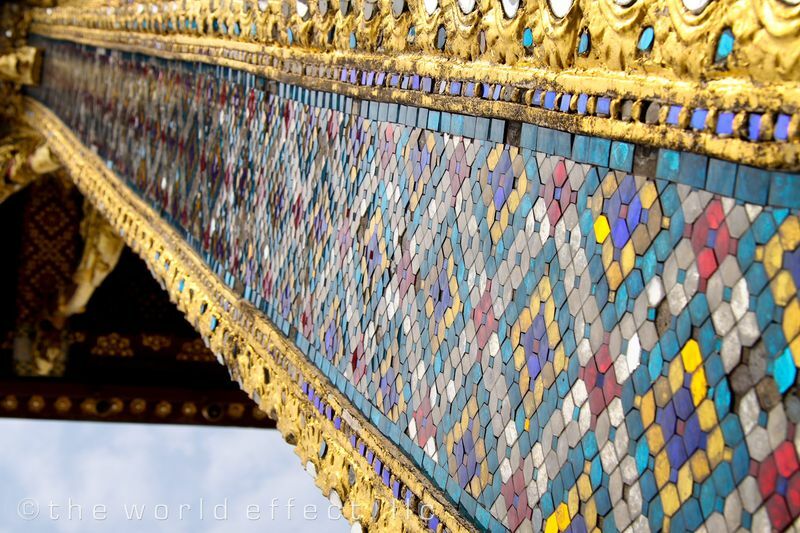 Gold, colored mirrors, and anything that sparkles was used to decorate the exterior of Wat Phra Kaew, known as The Emerald Buddha. 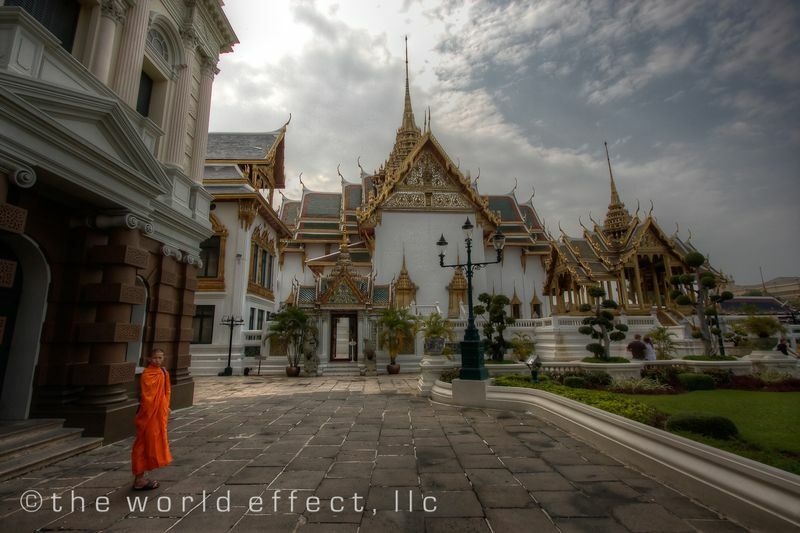 Wat Phra Kaew is located on the Grand Palace ground. 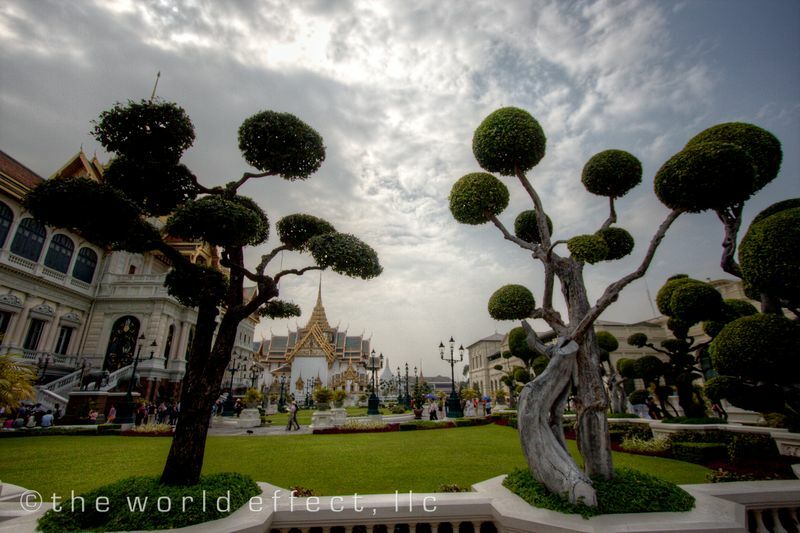 The Palace itself is a beautiful mixture of Thai and Western architecture with whimsical "Alice in Wonderland" landscaping. I know what you are thinking and no Beau and I did not eat the mushrooms on the lawn. 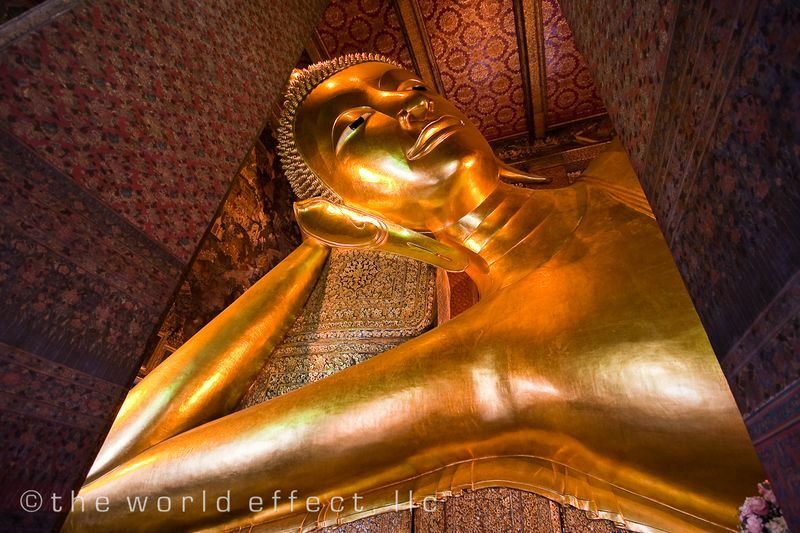 Our next stop was to one of our favorite Buddhas, the reclining Buddha at Wat Pho. I think it is one of our favorites because it is in great condition, it's massive, and its cold chillin'. 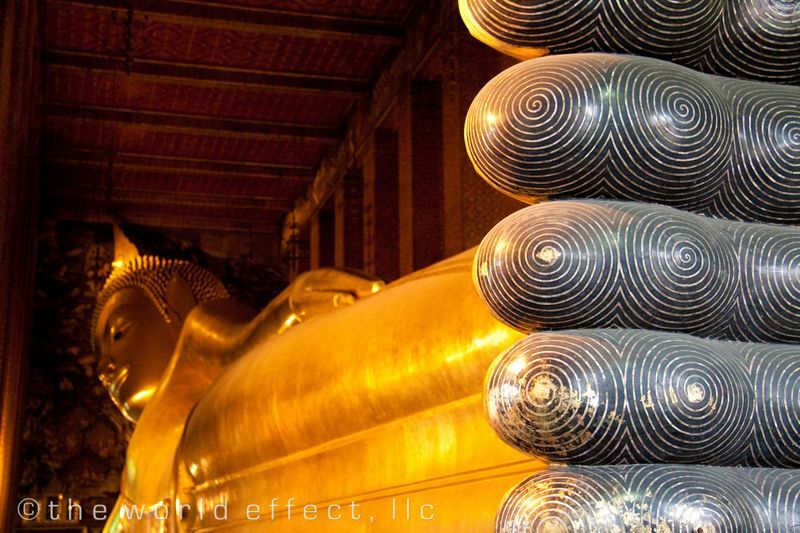 Who could dislike a Buddha that's relaxing? 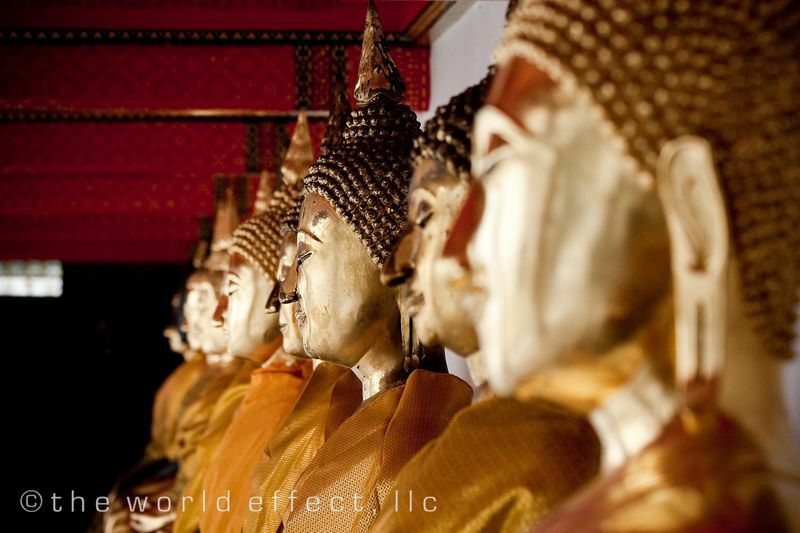 There are Buddhas, Buddhas and more Buddhas at the Wat Mahathat Temple. 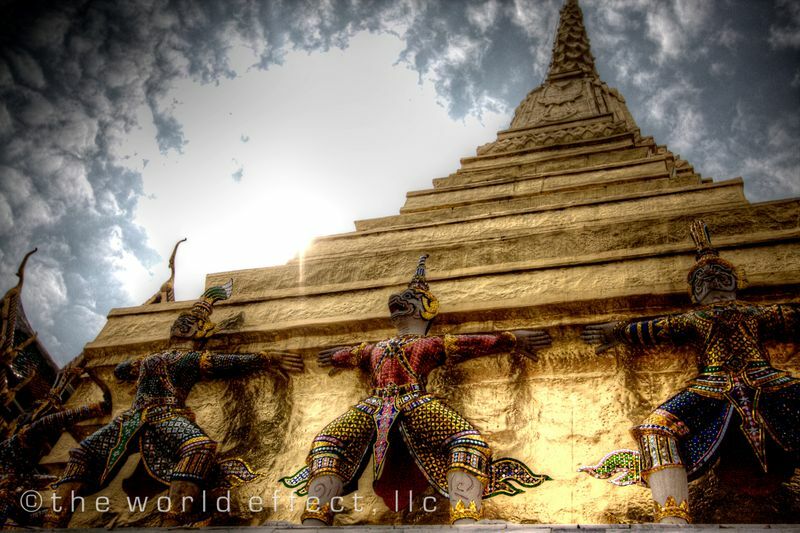 Wat Mahathat pre-dates even Bangkok. 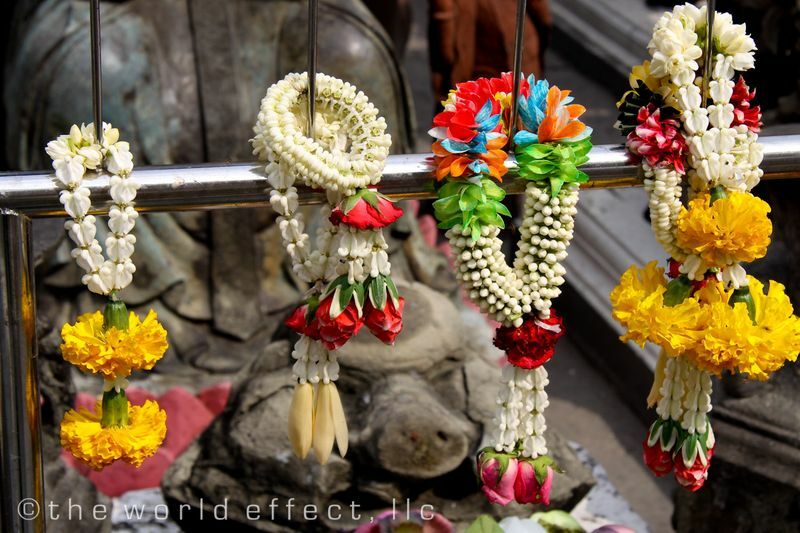 The Buddhas are there to represent loved ones that have pasted away. Up narrow steep stairs, we made the climb to the top of Wat Arun for the spectacular view of the Chao Phraya river and the city. 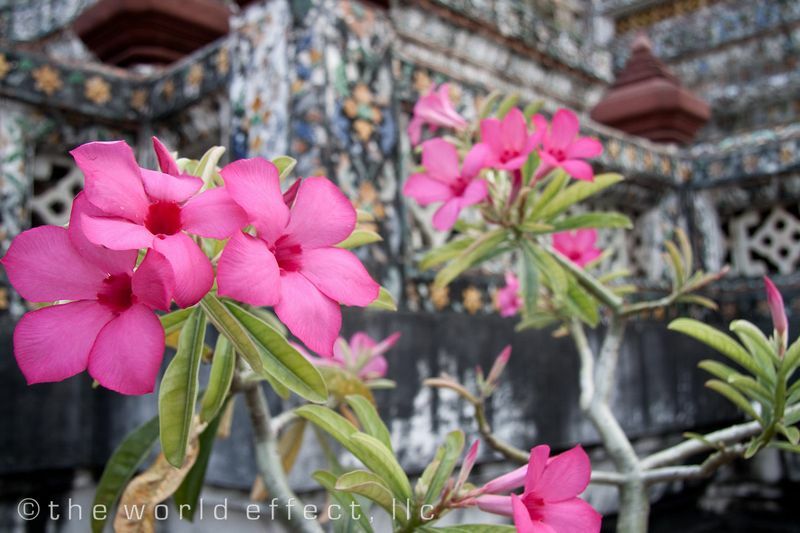 Wat Arun temple is a craft lady's delight because it looks like every broken porcelain plate in Bangkok was used to decorate it. Actually the porcelain pieces are from porcelain ballast that were used in Chinese ships on their way to Thailand to get cargo. 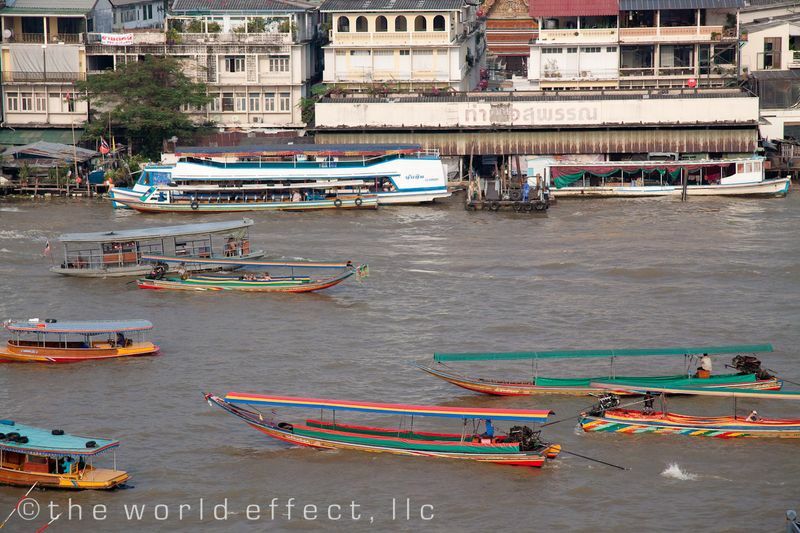 The porcelain ballast were tossed out to give room to the Thai goods. 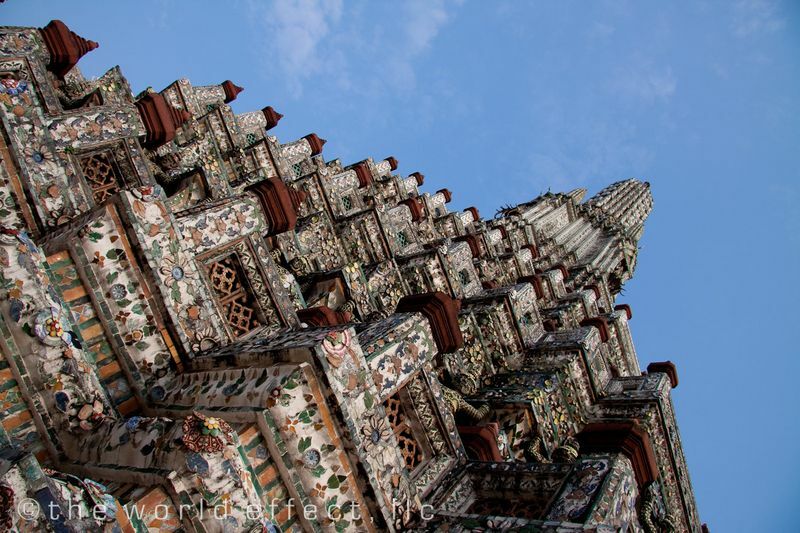 So Wat Arun is a wonderful example of recycling. 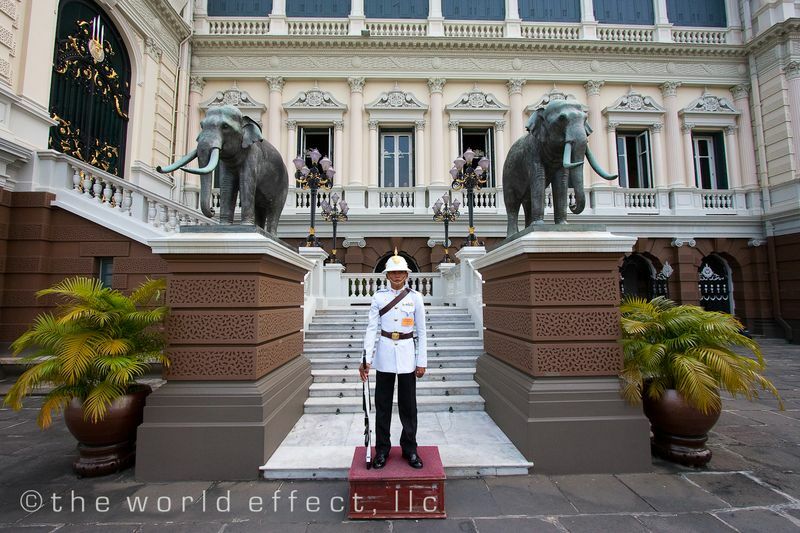 4 Responses to The pot of gold is in Bangkok, Thailand? Yeah, I’ve been waiting for Thailand! Great pictures as usual. I smell a food post coming?? Oh yes, you know it. I think Beau and I gained a least 5 lbs in Thailand. The jeans were feeling tight. The food post will be up shortly! Thank you again for your support. Hugs to your cute family! 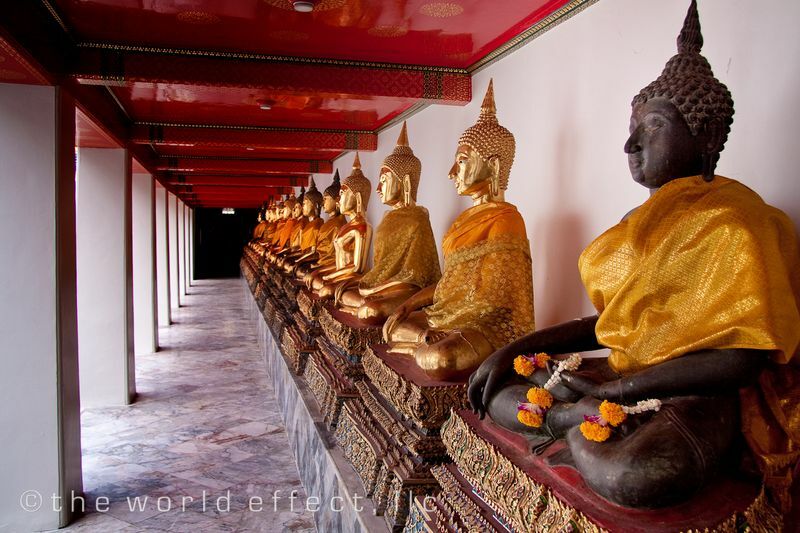 What richly, evocative photography from Thailand! 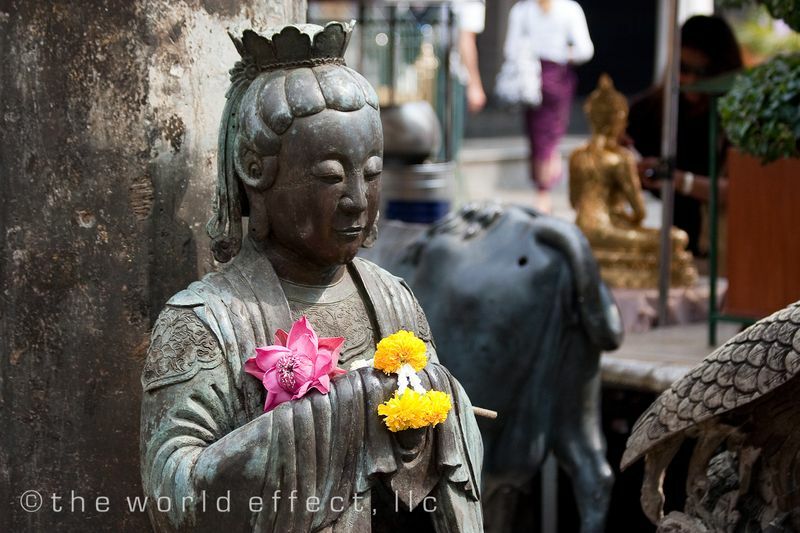 Your blog is always bursting with travel and photography inspiration. Thank you so much for the lovely compliment. We are working hard to improve our photography. It does help to be traveling and getting to see the most beautiful things everyday. Thank you for checking us. We really like your blog and have added it to our blog links!